Mama went and made that bluecherry pie, and the house has been hot ever since. She brought home some lovely, luscious apricots from a farm stand, and she decided it would be worthwhile to adapt a simple oven recipe to the grill (since she was using it to cook dinner anyway). Mama says you can grill fruit directly on the hot grates. She lightly oils or sprays either the fruit or the grates. Sometimes she mixes a bit of honey with something sour like lemon or lime juice and brushes that on the cut side of the fruit. And that’s it. Grill it until it has grill marks on it and gets somewhat soft. If you want to push it until it’s very soft with deep grill marks, that’s up to you! For this recipe, however, Mama used foil and closed the lid of the grill to simulate the inside of an oven. The foil caught the fruit juices, as well as the melted butter and brown sugar, so there was no mess to clean up afterward. A pat of butter, a spoon of brown sugar, and a hot grill are all these little apricots need to become just a little more special. 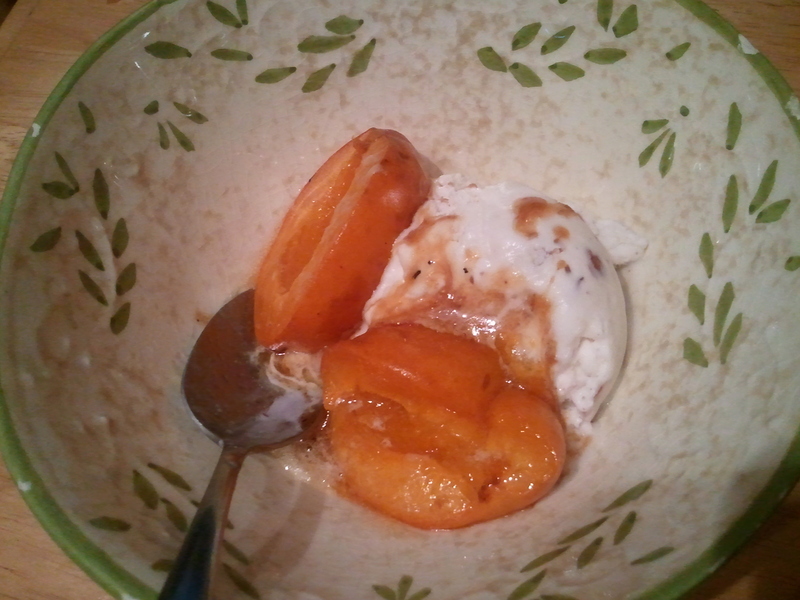 The warm apricots started melting the pecan ice cream. Mmm…. Go ahead an try this with any type of stone fruit–plums, peaches, nectarines. But don’t forget to try it with apricots. Get your grill going. Ours is gas, and Mama had it on medium-low, but it still got up to about 400°F. 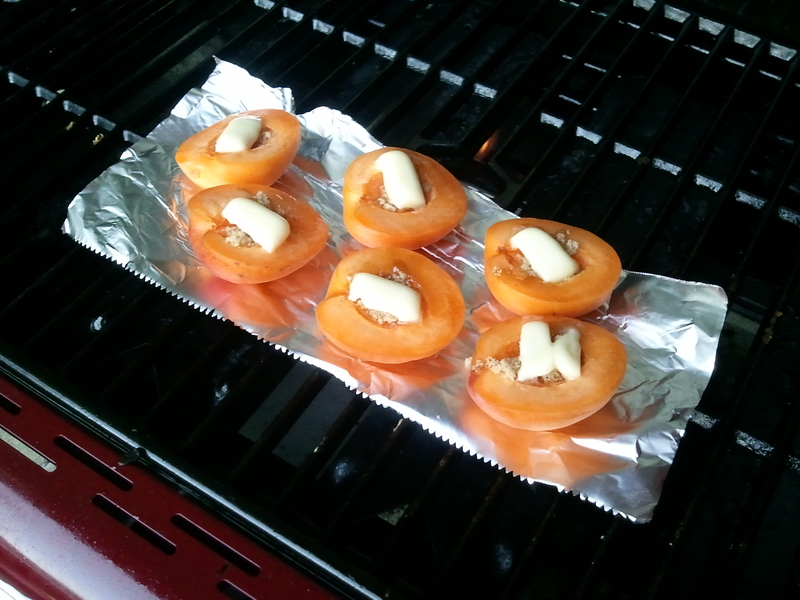 Place apricot halves, cut side up, on a sheet of aluminum foil. (You can do this directly on the grill, as Mama did, or prepare them ahead of time and transfer the entire sheet of foil to the grates.) Add 1 piece of butter and ½ teaspoon brown sugar to the center of each apricot. Close the lid of the grill and cook until butter & sugar are melted and apricots are soft and gooey, 10–15 minutes. Perfect as a treat on their own, or even better with ice cream. Be sure you eat all those sugary, buttery juices, too. Note: You don’t have to be exact about the measurements, and clearly, you can increase and decrease the amounts for as many apricots as you like. If you want to make these in the oven, lightly spray your baking pan and bake at 350°F for 15 minutes, or until they’re soft and starting to turn golden. Categories: Desserts, Hits, With recipe | Tags: apricots, baby food, cooking, cooking with toddlers, dessert, Grilled Sweet Apricots, grilling, recipe | Permalink. That post was really good. Check out all of our pages, we would really love to hear what you think about what we do.